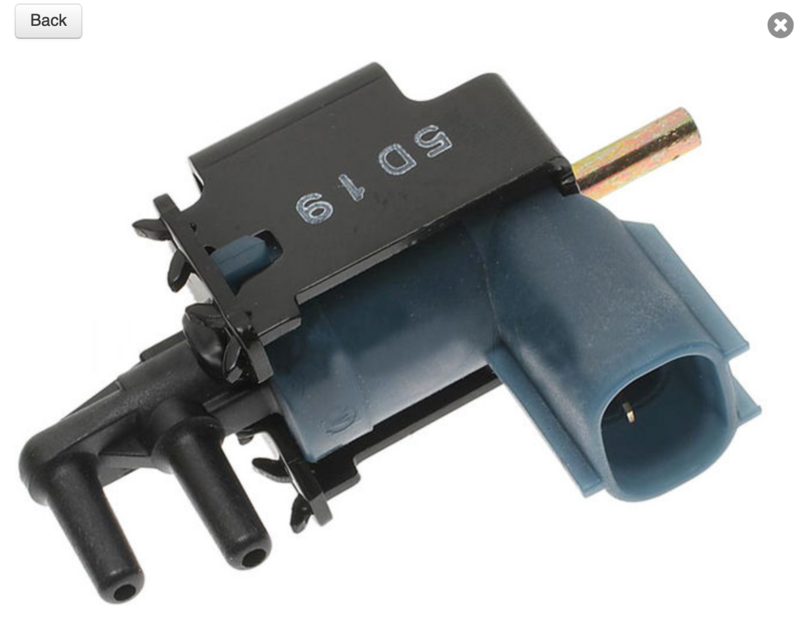 Running a P0446 - "Missing fuel cap, incorrect cap, jarred cap, faulty vapor pressure sensor, vapor pressure sensor harness is open or shorted or poor connection"
1. 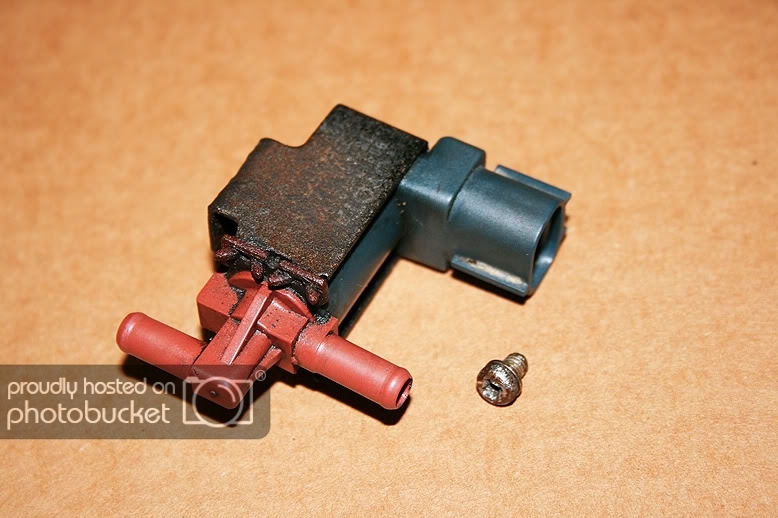 Replaced purge solenoid, code returned. 2. Went to junkyard, got whole different charcoal canister "just in case" $30 ($265 new). 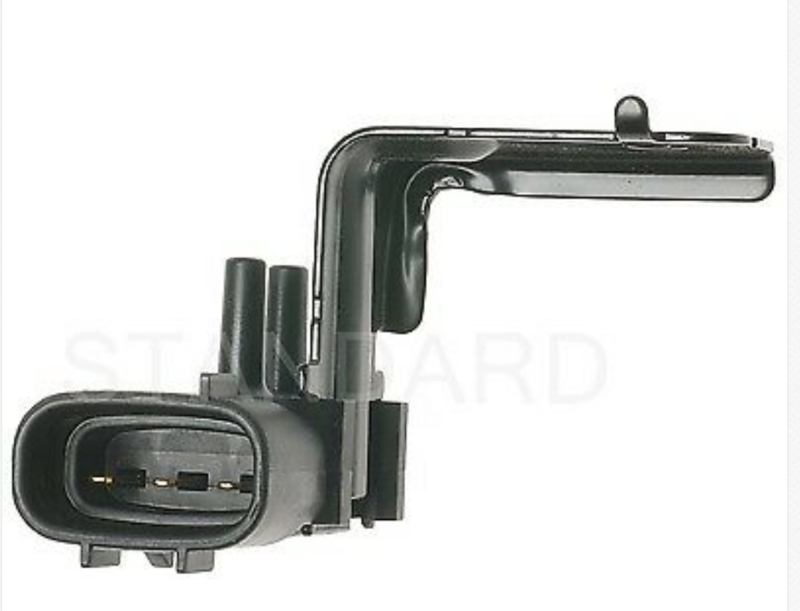 PS - What is the specific drive cycle test for the catalyst monitor for a 99 Camry 2.2L...? Calif. does permit testing if EVAP not yet ready, but my catalyst monitor MUST be reset. I'm pretty sure the vapor pressure sensor harness is next to the charcoal canister, but lemme tell ya, it's suuuuper cramped down there, and I don't have a lift or creeper and my jack stands are not super tall, plus my chest is pretty thick. So where is the vapor pressure sensor, and what it the drive cycle test for the cat..? My drive cycle tests had not yet completed so I tightened the gas cap. Today after 10 miles my drive test completed and the P0446 returned. I went home and swapped the Gas Canister Purge valve, or...I think I did. What I replaced appears at photo bottom LEFT. Why the two different doo-dads..? What's the diff between these two things..? 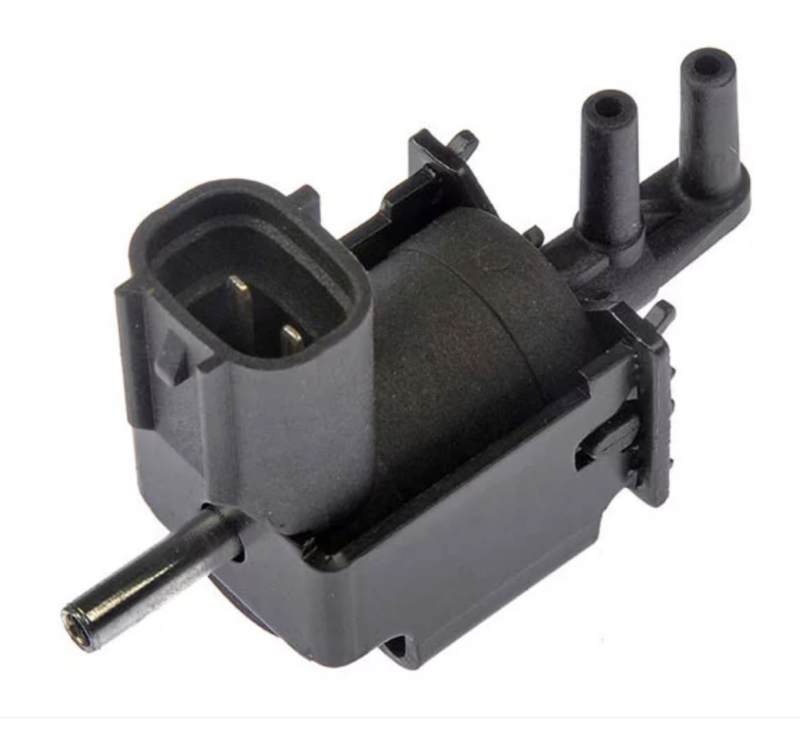 BELOW is what I swapped out, but Jegs.com calls this item the "vacuum switching solenoid valve". I think this is a different term for the same thing..? 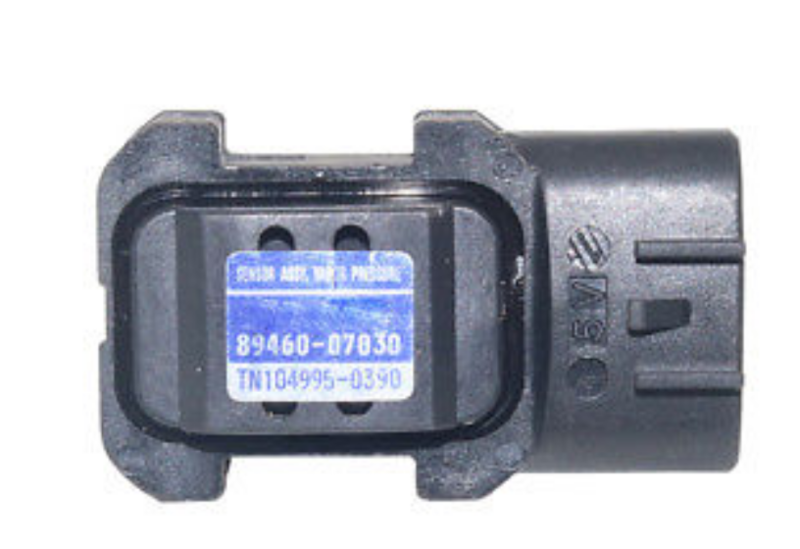 The last VSV you are showing is for the EGR system not the evap system. You should have started with the simplest thing, which would be buying a new OEM gas cap. I have had 2 people at work get this code on their Toyota's and both times a new gas cap fixed their problem. Can I simply use one from AutoZone..? You can, but sometimes they don't work. You might get a junkyard cap in good condition for cheap. Dealerships really stink. I would bet it is probably your gas cap. A gal here at work got an Autozone cap. It worked for 2 months and then she got the same code. She broke down and got an OEM cap 2 years ago and hasn't had the code come back. Gas cap is one of those parts that really is best with the OE part. It shoud be $32.16 at your Toyota dealer. If they are saying it's $44, simply ask them if they will sell it for the Toyota retail price ($32.16). Whenever I've done this the dealer has always agreed to that price (only one exception was for the air filter at this one particular dealer). Also, you can replace just the rubber gasket on your cap (if the rest of the cap is in good condition). That should be $21.12 at your Toyota dealer. Try online and you might find even cheaper prices. Watch out for knockoffs/fakes sold on E-bay. Did you check the wiring and connector for the vacuum switching valve at the charcoal canister? My son had a P0446 on his '96 Camry and when I inspected the wiring connector, one of the wires slipped right out of the back of the connector with hardly a tug. Got a new pigtail connector from the junkyard and soldered it on. P0446 fixed! Brit101, gaijin666 and insightbrewery like this. Bought super cheap O'Reiley's non-branded gas cap, $10. You can tell I'm poor, right..? One bit of good news; today when I took off the old cap to put on the new white trash one, I heard no air re-pressurization,"WHOOSH..!" sound as you ordinarily would with a GOOD gas cap after almost totally driving down the tank after a high fill-up. Because of that one clue I belieeeeeve that my whole problem might have been a BAD GAS CAP, in conformance with the assessment of the many Knowing Others in this thread. So perhaps it will turn out that I've been doing much needless work. Cleared codes, drove a bunch, all drive cycles complete except EVAP. Really hoping it finishes and no code but we'll see tonight or tomorrow. I've been screwd a bunch by the dealership so I just couldn't stomach that, plus I'm poor. As long as the EVAP drive cycle clears tomorrow with no code I will get the car smogged (this used car is from Arizona), get that Calif DMV paperwork and be happy for a good long while, periodically checking with my OBD2 to check for overlapping codes, in case a stupid EVAP one recurs. This is the first time I have bought an out-of-state used vehicle; is there some extra charge in California for that..? Legally I do not yet own this car, but have paid for it. I really wanted to buy the dealership cap but when I called ahead and they stuck with their $44 price. They're inflating the price. Do you have other dealers in your area? I have several Toyota Dealerships here in the San Antonio area. They almost always agree to sell at the Toyota retail price, which is indeed $32.16. If you have other dealers, I would check with them (yeah, I know you already bought an aftermarket cap, but still....). There's one dealership that tends to inflate the prices of the air filters for whatever reason, but they will agree to retail price on everything else I've proposed. Same for the other dealers I've tried. Sometimes I will get up to 15% less than retail price simply for asking. Brit101 and CamryFL like this. I cleared the code, drove around until I had just the EVAP drive cycle incomplete, then smogged my car since Calif still permits ONE devide to still read incomplete. For both HC and CO2 I didn't even rise to 10% of the max Calif. permissible levels on my 99 Camry, 203k miles; the TC-W3 technique seems to have worked very well. I lucked out and the dreaded code returned juuuuust after I had completed smog. I had driven away just 1 block or so when it lit up. I will still be checking on what's causing the P0446 code. What should I try next..? I'm dubious I require a whole new canister. Should I change the harness next..? Last edited by gaijin666; 04-16-2019 at 07:22 PM. Glad you passed smog. I live in SoCal and I hate the smog checks. I am not sure what the problem is but you now have 2 years to fix it. CEL's generally only apply to emissions and driving with a CEL wont hurt the car unless the CEL starts blinking. I am not sure which direction to go. Next smog check use premium gas and put an ounce of TCW-3 in the gas and your emissions should be almost non-existent. It might be your canister. I would try a junkyard one first since it would probably be dried out of most gas fumes and cheaper. Sometimes the hoses get clogged with bits of carbon from the charcoal canister. You made need to clear out your hoses or vacuum lines that connect all your evap stuff together. I have had his happen with my EGR system. No- Toyota OE only. Toyota EVAP system favors OE gas caps.